I am not here to support Wal-Mart. I am here to support teachers! 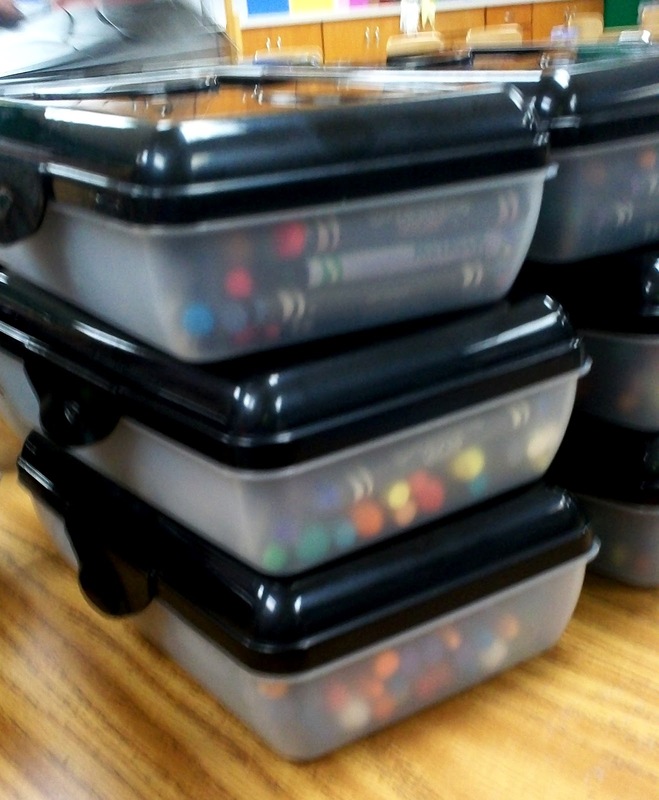 That being said, if you are in need of supply boxes....Wal-Mart has their pencil boxes for 25 cents a piece. Well...at least in our area they do. Not sure how that works elsewhere. Don't send me hate comments...if you think Wal-Mart is the devil...you are for sure welcome to your opinion. However, I want to find the best deals for myself(and usually that is NOT at Wal-Mart)....and if I can save you some money too...awesome! I have one box per table. Each supply has a different colored lid. Crayons are green, Markers are blue, Colored Pencils are clear, Scissors are pink, and now....Construction Paper Crayons are black. Wow! Checking out my Wal-Mart today! I love those school supply markdowns!! I would hate to count just how many of those "supply"boxes I have at my three schools!Too many Petro-Chemical products! I am like you, with different colored boxes for each art supply. It really is the fastest, most efficient way to dispense materials. Great minds think alike! Went to Wally World today and they've already put all of the school supplies back in the regular supply area! No deals in central Illinois... :( But, you've got great ideas for your kids. Sounds like you're a top-notch organizer! Have a great year! Cynthia S.
i need to do this. (and construction paper crayons are AWESOME! There are construction paper crayons?! They are awesome! It is formulated to work on construction paper...you won't have true color...they have almost a cream color base. I love them. Look amazing on black.